2015 for Mounts Cho Oyu, Shishapangma and Mount Everest. The situation is rapidly stabilising, and returning to normal. Everyone is eager for your return to freshly repaired and well maintained mountain routes, hotels, and lodges, to boost their families' and villages' economies, and for renewed climbing excitement on the highest, most beautiful peaks on Earth, the Tibetan Himalaya. We were up this morning at a cold 6 am for our transport from base camp. After an initial bumpy dusty road we got on our way to Shigatsu. The hotel is delightful without the base camp wind, hot showers, soft beds. A few of us had a walk up the nearby prayer wheel coveted hill, peaceful and very friendly. 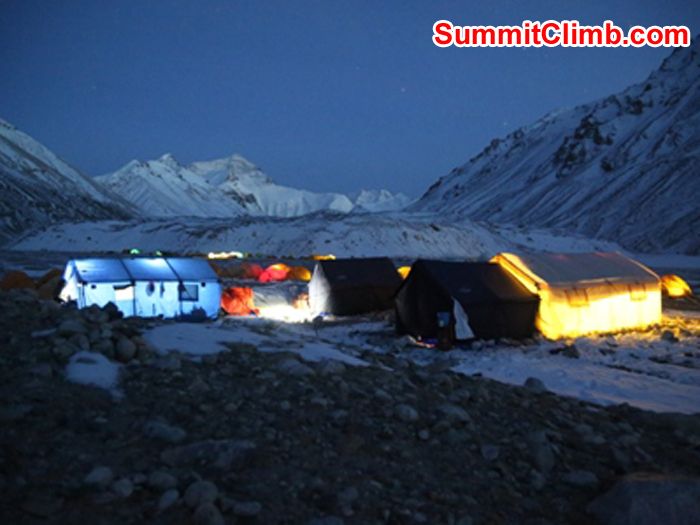 Today's Update from Expedition Leader: Base Camp has been extremely windy for the last few days. A few of us have headed down to the tented Tibetan tea house village 45 minutes walk down from base camp. It's a good place to get out of the wind. We're expecting the Yaks to bring down all our gear from ABC tomorrow and then transport to Lhasa is due on the morning of the 5 May. Everest Tibet & Mount Cho Oyu cancelled: Tibet Mountain Association. Teams heading to Lhasa airport; Nepal border closed by Earthquake. Hello everyone, we arrived back down to the relative safety and comfort of Base Camp yesterday evening. It is very sad to hear the continuing tragic news and of loss of life both on the South Side of Everest, in Kathmandu and the rest of Nepal. Our thoughts go out the families of all those affected. Our Sherpa’s also descended with us to try to get information about their respective families as communication is easier here. Most have now been able to telephone through to their families to confirm their safety, but as yet not all, clearly communications are down in several regions. Some have experienced damage to their houses. All of our Sherpa’s are however in good spirits and we hope to receive further good news from the remaining families. Activity on the mountain above ABC has been suspended for five days from yesterday, so most teams are now either at Base Camp or on their way here. Two new members Steve and Rob joined us today and we are all enjoying Base Camp life despite the events going on around us. Today's Update from Expedition Leader: THE SHERPAS SET UP SOME ROPES ON A NEARBY ICE PINNACLE FOR AN AFTERNOON OF PRACTICE. SNOWING NOW. Today's Update from Expedition Leader: WE ARRIVED AT ADVANCED BASE CAMP YESTERDAY AND HAVE SPENT A RELAXED DAY ACCLIMATISING IN THE WINDY SUNSHINE. Base camp night. Group at Monestary. We had a rest day eating good food and watching a let night movie yesterday. Ian took a great photo of our communal tents last night. This morning we walked down to the Rombuk Monastery for magical tour and blessing from the Lama. We were shown down a trap door into an ancient candle light cave . The lama showed us carvings and hand prints of deities in the cave wall, tracing our fingers around the outlines. We received the traditional white scarves and threw tsampa into the air to bless our journey. It was a lovely day and a chance to stretch our legs and see how we acclimatise. We had a lot of snow yesterday which closed the road to Base Camp. It's unusual to get snow in Tingri so it was nice to see a snow covered town rather than a dusty one. Some of us went for a walk yesterday up a nearby hill to stretch the legs and get some nice aerial views of the town. Today the snow had cleared so we set off on the dirt track drive to Base Camp. It was good to drive through some local villages and really see rural Tibetan life. We had a few stops and the local kids had fun running over to us to say hello. We all arrived at base camp to take up residence in our individual tents and had a good dinner of chicken and chips. Today is an acclimatization day in Tingri. Above is a photo of the team standing in the main street of Tingri showing the light snowy conditions. Good morning from Nylam! 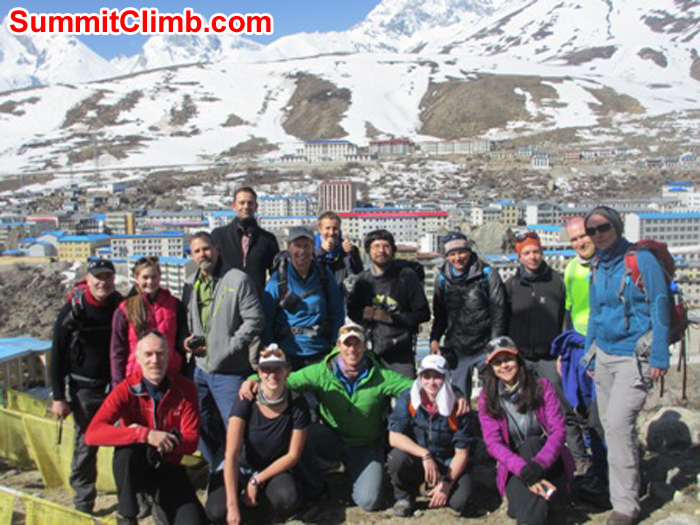 After two days at 3,700 meters above sea level the whole group is feeling great. This morning we are making our way to Tingri at 4,300 meters. It will be our final stop before we arrive at Base Camp. It is quite cold here, but we have gotten bright and sunny days to explore the town and take an acclimatization hike on a nearby hill. From these hills we were able to see the majestic, snow capped peaks of the Himalaya. This is truly a beautiful area. The above picture of our group (less those individuals who are in Lhasa) was taken at one of our first vantage points during our hike. With everyone in good spirits we look forward to exploring Tingri! Today Team Summit Climb (TSC) roused relatively early (8am for breakfast) to ensure an early departure from Nyalam for Tingri. The purpose (in which the team succeeded) being to secure better accommodation in Tingri. The morning skies were brisk and clear. 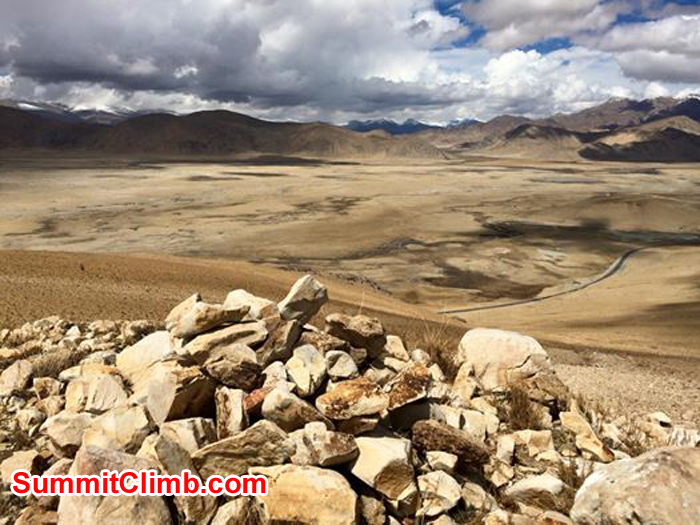 The scenic drive to Tingri climbed up to the +5,000m high pass and then fell to the Tibetan high plateau below. TSC and all the gear, arrive safe and sound in Tingri in time for lunch. Everyone then took to explore Tingri in the steps of Mallory, Tilman and Shipton. Cloud cover blocked view of Mt Everest. 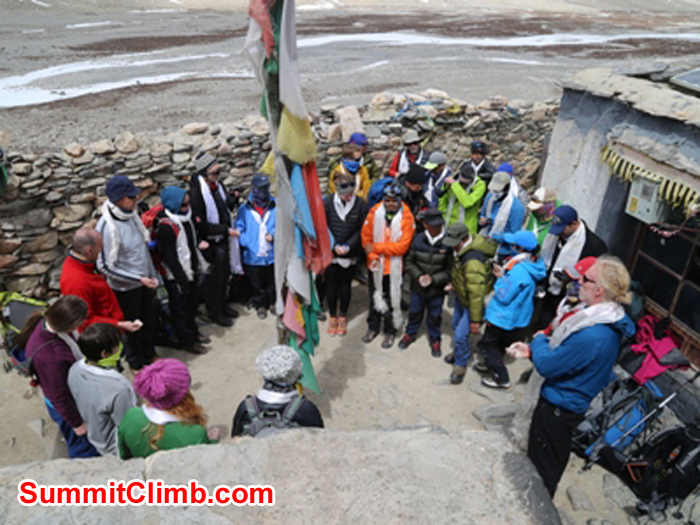 TSC will pass another rest day in Tingri tomorrow to acclimatize before heading to base camp the day after. Hi this is David, leader of Everest Tibet expedition. We had an early start this morning. Up at four am for the drive to the border with Tibet at the friendship bridge. After a very speedy, road side repair to a puncture on our coach, we drove on the twisty and stunningly picturesque river gorge road to arrive at the border late morning. As we crossed the bridge we were chosen to be the face of the new friendship bridge tourism poster and had many orchestrated group photos taken. Who knows, maybe we’ll now appear on giant posters at all Chinese border crossings! David O'Brien Tibet Everest Leader. Zsolt Torok Photo. environmental talk in Namche. Deha Shrestha, SummitClimb IT Manager, preparing solar equipment for Everest. Jangbu Sherpa, Sange Sherpa, and Murari Sharma preparing tents, epigas, and drums for Mount Everest.